We have a winner! Congratulations to Sharon, aka The Queen of Fifty Cents. Maria Noble of St Jude's Creations [edit: site no longer available] makes incredibly realistic flowers from crepe paper and paper clay. She lives in Connecticut and has been creating flowers since childhood. Maria learned techniques from her mother and aunt who made blooms from fabric, paper, and other materials for weddings and special occasions. Maria began St Jude's Creations ten years ago using her mother's and aunt's methods, as well as her own ideas. 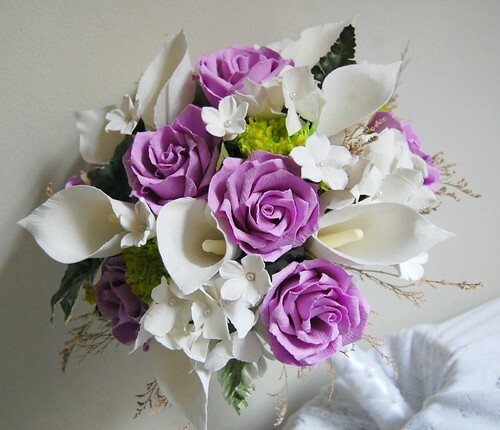 She enjoys working with brides to meet all of their wedding day floral needs, and can recreate a bridal bouquet in paper as a first anniversary gift. Maria has collaborated with event planners and businesses from New York to L.A., and her work has been seen in magazines and online. The photo below, for example, shows bright blossoms made for a Pottery Barn girls' bedding display. And now, a giveaway (yes, another one)! Maria, who is a brand new sponsor here at All Things Paper, made this pretty crepe paper and paper clay arrangement a few days ago to send to a reader in the U.S. 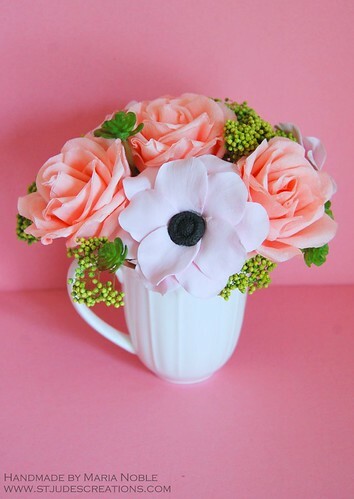 The white tea cup holds hand sculpted peachy pink crepe paper roses and pink paper clay anemones with black centers. Green succulents and dried flowers add to the mix, creating a 6 x 5 inch arrangement that's just right for spring. The giveaway ends on Monday the 6th, so enter right away by leaving a comment. With Mother's Day coming up on the 12th, it's very possible the flowers could reach the winner by then! Maria is always happy to work with clients to make their floral dreams come true. Contact her via her website or via Facebook. By the way, Brittany Watson Jepsen (previous post) won the Kentucky Derby contest on the Today show yesterday with her paper rose hat! Those flowers are breathtakingly gorgeous. What a wonderful talent to be able to create them and share it. 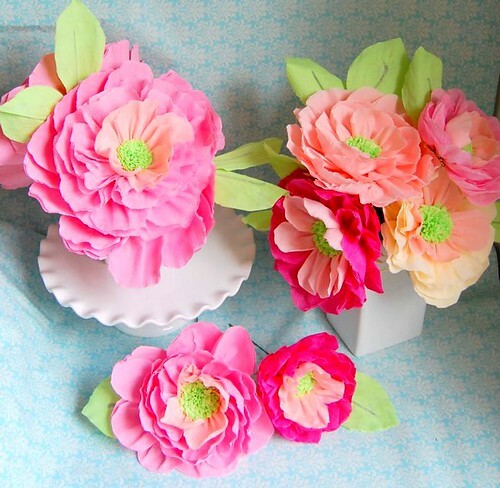 Love the mix of paper and clay flowers! Maria, Your work is breathtaking and beautifully and lovingly crafted. I just had to sit here and look at your flowers over and over, so exquisite. Those salmon roses in the teacup are perfection and the arrangement would look wonderful on my mother's dresser and would be the most special Mother's Day gift! Wow ! SO beautiful flowers ! wow really gorgeous flowers ,lov them !!!! WOW. Her flowers are stunning! I wish I were that good. Those are gorgeous. I would love to win the arrangement for my beautiful Mother. She's in her 80's now and doesn't get around much, but she adores pretty things. She would be thrilled to receive them. Those flowers are beautiful, would love to win them!! these are beautiful! - amazing of what starts out as pieces of paper end up looking like this. Am constantly amazed at paper artists who can create wonders...like these lovely floral arrangements. Maria's flowers are so beautiful! Her new book is on my wish list. 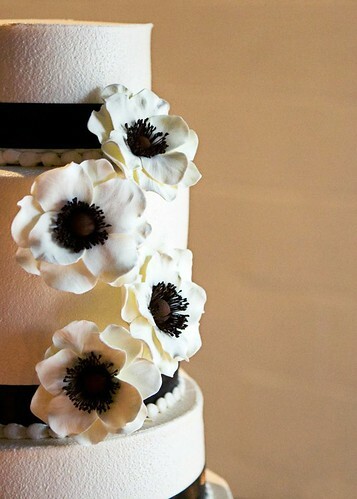 Gorgeous florals...love the black and white wedding cake! A classic! These flowers are beautiful. I would love to win them and have them sent as a surprise gift to my friend in Chicago who I met on Facebook after 28 years. All of the flowers are so beautiful. What I wouldn't do to have that kind of talent! I saw Brittany on the Today show on Friday. Being a native Louisvillian and knowing that the Kentucky Derby is THE day in Louisville I knew immediately that her hat was the winner. It was spectacular!!! I would love to win this beautiful bouquet so that I might have a wonderful reminder of Brittany's amazing talent. WOW! Her flowers are remarkable!!!!! Thanks too, for a chance to win. Amazing! Beautiful flowers that last forever, who could say no? They are so beautiful! Would love to win. Those flowers are gorgous!!!! And my favorite colors too! WOW! your flowers are awesome. her flowers on the cake are especially gorgeous. would love this for my wedding cake!! Lovely, better than the florist! This arrangement is so pretty! I wish I were that talented! I love it! And I would love to have the book. Oh my gosh they are so beautiful! This is a wonderful example of someone who has perfeted their craft!!! The giveaway has ended; thanks for your enthusiasm! Just wanted to let you know that the arrangement arrived a couple of days ago. It is just beautiful. Thank you SO MUCH!